Posted in CELTA, English on February 16, 2017 by Alisha Debara. Hi, my name is Barkha Vahi and I have been a teacher for five years now and have taught at private schools, corporates, and language schools. I had completed another initial certification in EFL teaching which only motivated me to do The Cambridge Certificate in Teaching English to Speakers of Other Languages (CELTA). When I started teaching and looking for prospects abroad, one name which came up, again and again, was CELTA and I couldn’t have avoided acquiring this certificate. 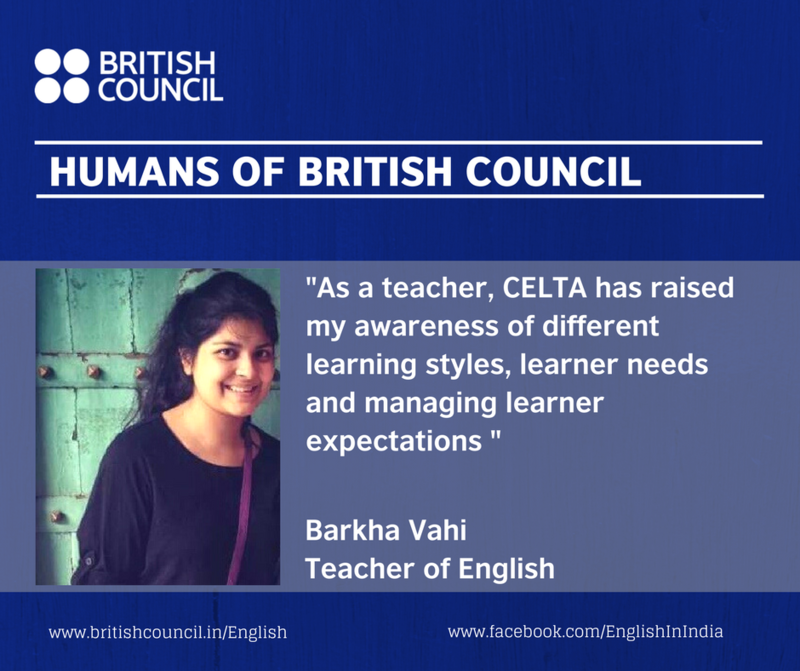 As an ELT professional, I couldn’t imagine a pathway forward without having completed CELTA. CELTA lived up to its reputation of being super intensive. 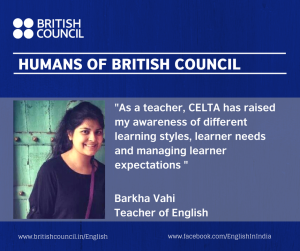 Even though I had previous experience in teaching, CELTA gave me a fresh perspective to a lot of concepts which I dismissed earlier. Initially, it was difficult for me to be able to adapt to all the input but when I sat down to analyse everything pragmatically, it just seems to flow so logically. My teaching changed forever. Now every time I walk into my class, I know exactly what I am doing, how I am doing and why am I doing it. As a teacher, CELTA has raised my awareness of different learning styles, learner needs, and managing learner expectations. It has helped me so much in planning lesson aims and achieving them by the end of the lesson. CELTA has been a great experience. I am in touch with my tutors and seek help if need be. It has opened doors for me globally and gives me an edge in the industry. I would recommend this course to anyone who is seriously thinking of getting into the ELT industry.